The family of Cartoon Network mobile apps had a bit of a problem in their respective app stores: a steadily growing number of negative reviews, but no decline in the popularity of said apps. Sort of an interesting phenomenon, because one may assume that if the ratings of an entire library of apps are tanking, one could expect to see downloads and WAUs following. But we weren't seeing that at all, in fact the opposite. Slightly baffled, we realized we need more insight. SUMMON THE INTERNS, we've got hundreds of app store reviews to read! pages were essentially being used as a technical support forum. This of course was a complete lose-lose for us and our users. Our QA branch was missing out on very important technical feedback and our most dedicated users were left without a proper channel to deliver this information and were thus screaming into the void of the internet. Not a particularly good relationship. If only there were a method of intercepting frustrated users on their journey to our app store review page and perhaps surfacing information that may help solve their app problems or put them in touch with our support team so that both parties could have a much better shot of fixing the actual problem. Luckily, this is the internet, and on the internet, anything is possible. After doing a bit of research, our strategy team found a service that we could purchase that would provide our users with many more appropriate outlets for their joy or frustration. 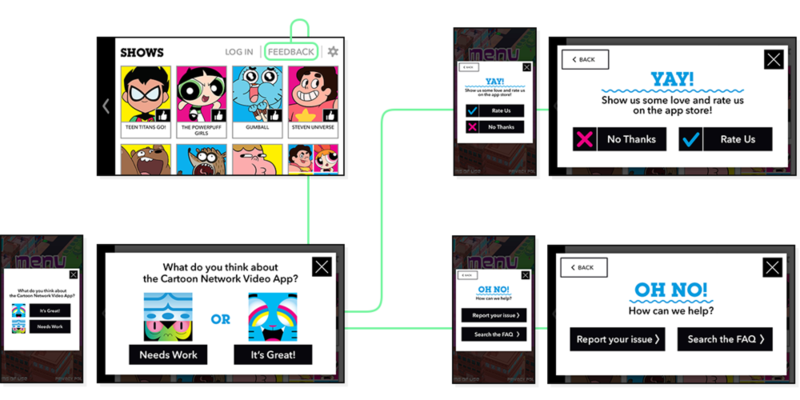 It was also decided that these new customer support flows would be standard across all apps published by Cartoon Network. That meant that all of these new flows had to be skinned with Cartoon Network branding. This is where my involvement with the project was at its heaviest. I would be adjusting and skinning the flows to seamlessly live within a myriad of products in the Cartoon Network ecosystem. Among these flows was a particularly important and challenging one: A modal would be intelligently surfaced to users asking whether or not they were satisfied or unsatisfied with the product. Based on their answer, they'd be forwarded to either the app store to leave a (hopefully) positive review or to the FAQ/Support to help solve their problem, respectively. While strategically a very challenging problems, it also posed a very interesting UI challenge. For the user, this modal would be surfaced seemingly out of nowhere. If handled incorrectly, it could potentially be very disruptive and disorienting. Beginning by clicking on the "feedback" link in the main menu (originally, this feature was just going to be rolled out to the CN Video app) or by the feedback modal being triggered by a fresh app launch, the user would be greeted by two options for feedback that would be tonally consistent with the brand. The two images would change to reflect the show the app was based on and would be channel branded for multi-property apps. Its important to note that the younger end of Cartoon Network fans are roughly kindergarden age and haven't mastered reading quite yet, so the importance of bold icons and artwork that reinforce app messaging can't be overstated. The same thing goes for the language used in the copy: a conversational tone is much easier to understand than a clinical one. contracts for existing apps would have to be renewed with with their respectivecompanies possibly years after termination. We opted instead to create a common menu system that could be retroactively applied to all existing apps and new ones going forward. The menu had to accommodate the app logo and an optional partner logo as well as multiple variations and numbers of menu items. While the breadth of these systems was satisfying, I wouldn't know the satisfaction of seeing their effects. By the time these features had launched, I had moved on to another roll outside of Cartoon Network, and no longer had access to internal metrics.